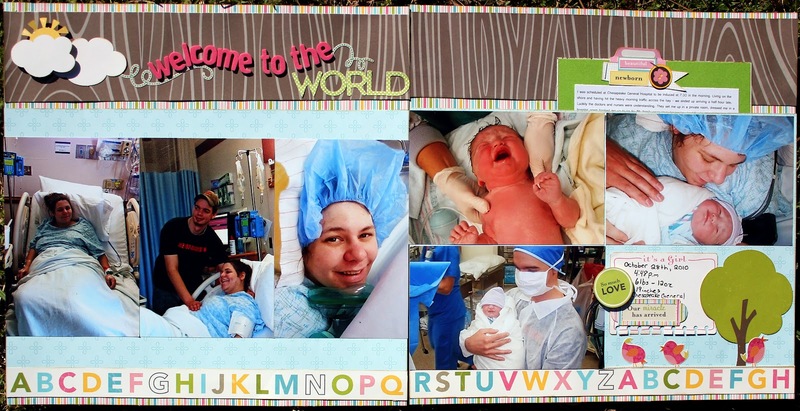 Christina Collins: Two page layout - "Welcome To The World"
Two page layout - "Welcome To The World"
We're all moved in and my scrap corner has finally been set up. While it's nothing fancy, it is quite functional. I love it! I was able to give my organizational system a go during my daughter's nap time, yesterday. The result? A two page layout! 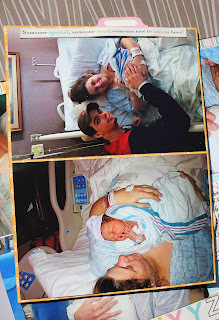 Not only that...but a two page layout with the photos from the day my daughter was born. I finally worked up enough courage to scrap them. I am happy with the results. I still have more to scrap but this is a start. (My apologies in advanced for the craptastic photos of this layout. The lighting was horrible no matter where I went. Even outside!) The (majority of) papers, the green alpha stickers that spell out World, and the (majority of) embellishments are from October Afternoon's "Ducks In A Row" collection. The rest of the title is spelled out using American Crafts' Thickers. The little swirlies near the title and the birds next to the tree are from Simple Stories' Fabulous Collection. I'm unsure of which company made the wood grain paper. This layout is interactive. 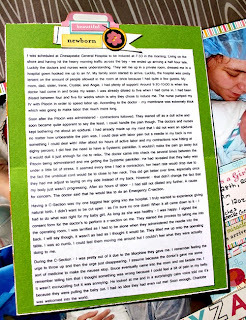 If you pull on the little section of embellishments that is sticking out from behind the photos you'll reveal a little insert that has the birth story along with a few extra photos on the back. I hope you all like it! 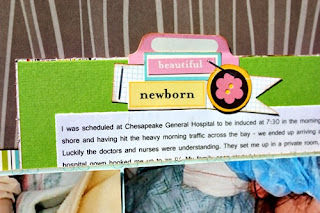 I do and I am getting much more comfortable scrapbooking two page layouts. oh, totally cool! I love the way you put the story in that little pocket with the file tab! That is SOOOOO cool!!! Christina, I am so glad you go another 2-pager done! This was a great one and look how many photos you got on there! Rock on girlie! This is definitely an event I need to scrap. My pictures were horrible due to the bad lighting in the OR and my husband trying to keep up with everything. Even though most of them are blurry, I treasure them. I haven't had any papers jump out at me as being the 'right' ones. As soon as I find them, I will probably scrap them. I love this double layout! it's so cute! I just used the ducks in a row collection to make a page for my son's baby book last week! I also bought the bella blvd baby boy collection, have you seen it yet? oh my goodness it's SO cute! Perfect for baby boys! (they have one for girls too). anyway, thanks for sharing this, love the pics you got, I wish I had taken better pics back when I was having my kids. (20 and 15 years ago! lol) BTW, it would be SO much easier to leave comments if you would enable the name/url option on your blog. So glad your corner is working for you...WOW! You really did a lot of work...these are not easy to scrap, but such a priceless moment...beautiful! I need to do this. I have so many photos from when my babies were born. Wonderful moments! I love how you hid the birth story. Such a great layout. I like the tabs with more info on them and more photos. Love how you added in the extra journaling!!! Glad your scrap stuff is all set up, that probably feels great!! Really love this layout and the colours are very nice.